"UN provoke mourners, gun down the unarmed, blames the killing on the crowd of mourners at Father Jean Juste's Haiti funeral"
Is this the *Face of the Revolution*? Unbelievable! A man is killed on the streets of Port-au-Prince during Father Jean-Juste's funeral march. The head shot is a favorite shot of the UN occupying force in Haiti. It is used as a deterent of sorts -- want to protest the occupation or any other injustice, this could happen to you. More details on the shooting here and here. The UN is attributing the shooting to a Haitian. This attempt to blame a Haitian among the mourners gathered at Father Jean Juste's funeral is not credible. These UN soldiers have a history in Haiti. They have committed massacres, rapes (more), murders and other crimes during their brutal occupation since the US sponsored coup of the democratically elected president (Aristide). The MSM in the US turn deaf ears and blind eyes to Haitians suffering these kinds of indignities and injustices just miles from their unfriendly shores. These Black voices are not heard. All eyes and ears are fixed on what is happening many thousands of miles away in Iran. This photo was taken on August 15th, 2007, across from the Presidential Palace during a demonstration calling for the safe return of Lovinsky Pierre-Antoine. These UN soldiers were among a group who were surrounding the presidential palace, photographing the demonstrators. How many are dead from this UN occupation? Many thousands now since the US sponsored coup of Aristide in 2004. The Lancet reports over 8,000 murdered and over 35,000 raped -- but that is just the conservative estimate. Note: the US also sponsored a coup in 1991. Once again the criminal(s) walk away free with the blood of a Haitian on their hands. Video Footage of shooting: Cue the video to 1:19 for the shot fired by the UN at the crowd level from the back of a small pickup truck. Ezili Danto reports that: "Since the 2004 Bush Regime Change/Kidnapping in Haiti, the UN forces have customarily and automatically profiled as "criminal" or "bandit" any young Haitian male or Vodouist wearing dreadlocks because the ruling Catholic/Francophone, light-skinned Haitian Oligarchy think them to be too 'Black and African.'" Read her account of the circumstances surrounding the shooting. Haitian priest Father Gerard Jean-Juste, a symbol of strength, courage and leadership to a great many, was to be laid to rest by his family, friends and supporters on June 18. Few expected the solemn occasion would be transformed into confusion and terror as U.N. forces opened fire towards Haiti’s national cathedral following the arrest of one of the mourners. A victim of a single gunshot wound to the head would be discovered moments later. Witnesses say his body writhed and convulsed struggling with the inevitable as blood slowly formed a crimson background around his head. Jean-Juste would probably not be surprised by the shooting given that he was a leader of Lavalas and this was after all a Lavalas funeral. He would most likely recall many other instances of human rights abuses committed against Lavalas where the U.N. was complicit or directly involved. He would often criticize the U.N. mission in Haiti for killing unarmed civilians in Cite Soleil and for training the Haitian police as they regularly shot up peaceful demonstrations, performed summary executions and falsely arrested Lavalas supporters following the ouster of Aristide in Feb. 2004. Jean-Juste more than most, would understand that this incident is but one more in a long list of violent offenses committed against the movement of the majority of the poor in Haiti as part of the U.N.’s current experiment in political landscaping. Kevin Pina makes so many invaluable contributions to Haiti with his writing, filming and documenting of horrendous incidents like this. 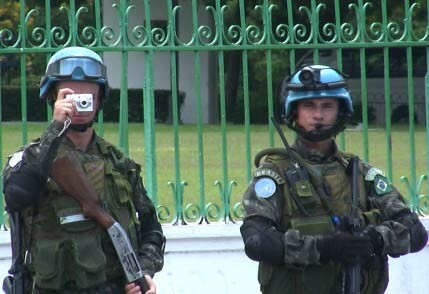 In particular, I was not surprised by the UN's brutality and inhumanity in this instance because I saw this video where it is documented that MINUSTAH forces were taking head shots calculated to inflict death and took part in what is recognized by activist and human rights organizations as a massacre of the civilian population of Site Soleil. Haitian's are familiar with innocents being gunned down by the United Nations.